BOAO, Hainan, April 11 (Xinhua) -- Chinese President Xi Jinping said Wednesday that the Belt and Road Initiative is not an intrigue of China, as alleged by someone overseas, but aimed at benefiting more countries and people. "[The initiative] is neither the Marshall Plan after World War II nor an intrigue of China. 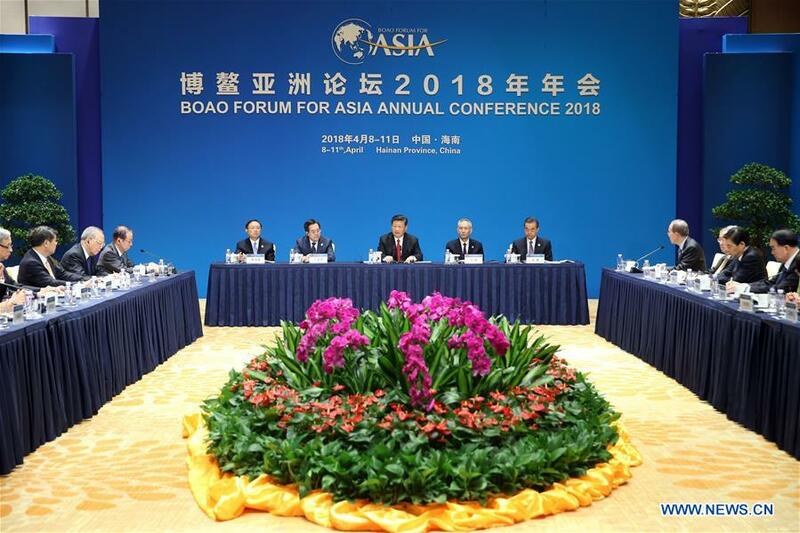 It is, if anything, a plan in the sunshine," Xi said when meeting with incumbent and incoming members of the Board of Directors of the Boao Forum for Asia (BFA), who gathered here for the BFA annual conference. "What we uphold is seeking shared growth through discussion and collaboration," the president said. The initiative is aimed at achieving policy, infrastructure, trade, financial and people-to-people connectivity, building a new platform for international cooperation, and creating new drivers of shared development to benefit more countries and people, Xi said. BOAO, Hainan, April 11 (Xinhua) -- Countries should all be committed to building an inclusive world and creating a harmonious atmosphere, said Chinese President Xi Jinping here Wednesday.